On 2 May, 2015, H.E. Liu Xiaoming, Chinese Ambassador to the UK, was invited to present medals to the winners of the 2015 FINA/NVC Diving World Series - London at the London Aquatics Centre. The Ambassador's wife, Hu Pinghua, and Xiang Xiaowei, Minister Counsellor of the Cultural Section at the Chinese Embassy, were present. The day's competition included three events: women's 3m springboard final, men's 3m springboard final and mixed 3m springboard final. The world's top contestants took part in the competition, including Shi Tingmao, Wang Han, Lin Yue and Cao Yuan from the Chinese diving "dream team", Mr. Zakharov from Russia, and Mr. James from the UK. It was an intense competition as divers took lead alternately and enthusiastic spectators cheered them on. China's Shi Tingmao won the women's single 3m springboard final, and two other Chinese divers, Yao Hao and Wang Han, won the mixed 3m springboard final. Kuznetsov from Russia bore the palm of the men's single 3m springboard final. At the invitation of FINA, H.E. 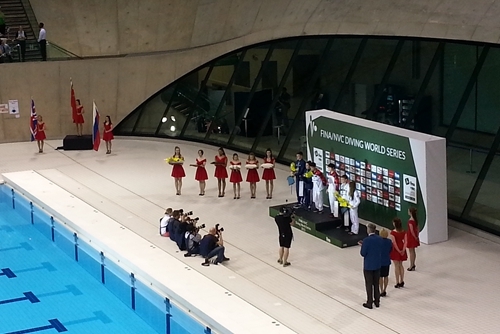 Ambassador Liu presented the medals to the winners of the women's 3m springboard final. He congratulated the Chinese diving "dream team" on their good performance and encouraged them to make persistent efforts and win honor for the motherland.